Summary: Zuri Benitez is watching the world change around her. Having grown up her whole life in Bushwick (in Brooklyn), Zuri is seeing her neighborhood slowly being gentrified; her older sister Janae, who is back after her first year of college, is also different; and Zuri herself is getting ready to finish high school as well. Thoughts: It is a truth universally acknowledged that if there's a Pride and Prejudice retelling, I'm definitely going to check it out. Some (like The Lizzie Bennet Diaries) interest me way more than others (the Mormon one, for example, or the dog show one). But when I heard that a modern, urban, YA retelling featuring Afro-Latina Bennett sisters, I WAS SOLD. It is a fun, cute read. As an upper-middle-class Asian-American woman, I did not understand everything that teenaged Zuri talked about regarding her life, whether it be life in the hood or her family's cultural traditions. (The Benitez family is Haitian-Dominican.) That's okay, though, because I can understand that maybe I was not the target audience for those parts. 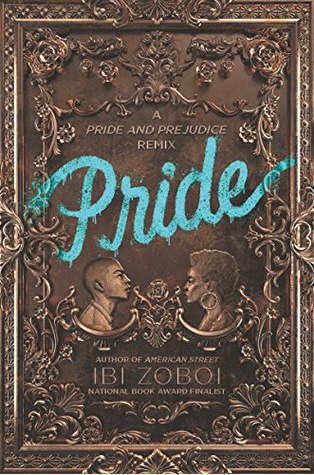 However, this did not take away from my enjoyment of the book at all, and I felt like Zoboi did a really good job of translating a lot of the original aspects of P&P across all these different categories--culture, society, time, and age. I feel it would be unfair to expect Zuri and Darius to be the Elizabeth and Darcy that we know and love (a la Jennifer Ehle and Colin Firth), but they make wonderful counterparts, and I LOVED seeing their relationship unfold. And like Jane Austen, Zoboi includes a healthy dose of social commentary in her book. 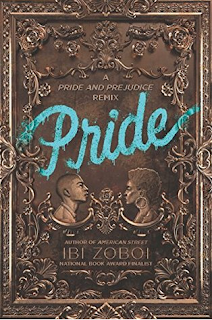 Austen had plenty to say about gender roles and norms and social classes, and so does Zoboi, but specific to Pride's setting is the intersection of race with gender and class, and the issue of gentrification. Zuri isn't just averse to change for no reason; she's watching her neighborhood get taken over by hipsters and rich people. Even the corner bodega has started hanging up signs that say "Organic" and increasing its prices. Zuri worries about the changing landscape of her home and wonders whether she will still have a home to come back to after she has graduated high school. So yeah, I definitely, highly recommend this book, but you have to know going into it that it's going to be a different experience from basically any other P&P retelling out there, especially if you don't personally relate to various aspects of Zuri's life. But keep an open mind, and I think you'll find this "remix" quite enjoyable.